ANIMATION OF THE CIRCULATION OF THE BLOOD: Double Circulation of the Blood (through the lungs & through the body) showing the path of oxygen and carbon dioxide. 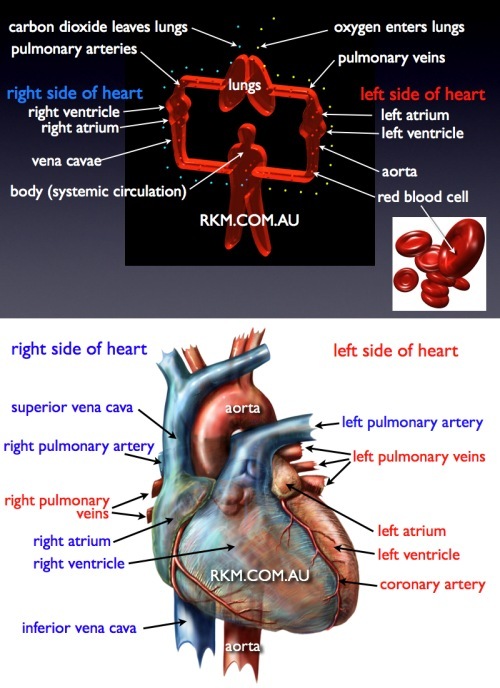 Double Circulation of the Blood refers to the passage of the blood firstly through the lungs (the pulmonary circulation - where it picks up oxygen and releases carbon dioxide) and then through the body (the systemic circulation) where it delivers its cargo of oxygen and picks up carbon dioxide. These two circuits are powered by different sides of the heart. The right side of the heart pushes the blood at relatively low pressure through the lungs. The left side of the heart pushes the blood at relatively high pressure through the whole body. THIS ANIMATION IS HIGHLY SCHEMATIC and (to make the process more understandable) the circulation has been unravelled and the two sides of the heart have been separated. This makes it clear that there is really only one circulation but that it happens in two stages (in series). The right side of the heart (at left of graphic) pushes the blood through the lungs (at top of graphic). The passage of carbon dioxide is illustrated as a flow of blue particles from the body and out through the lungs. The intake of oxygen through the lungs and to the body is illustrated as a flow of yellow particles. The vascular system (blood vessels) is illustrated as a tube connecting the right heart to the lungs, the lungs to the left heart, the left heart to the body and the body back to the right heart. The red blood cells can be glimpsed moving within this tube. The system of vessels and the heart is known as the cardiovascular system. The heart is really a highly specialised segment of vessel that is muscular and supplied with valves (heart valves) to create the one way flow of blood. In the heart, the two sides are joined and the complex plumbing of vessels makes the flow rather difficult to understand. 1. deoxygenated blood returning from the body enters the heart through the superior vena cava and inferior vena cava. THE CORONARY ARTERIES branch from the aorta as soon as it emerges from the heart (please see diagram of the heart at left). They deliver oxygenated blood the the heart muscle. Coronary artery disease (or coronary heart disease) involves the build up of deposits in these crucial vessels. This reduces and sometimes completely blocks the flow of blood resulting in a heart attack (see the coronary heart disease video).